There are probably a dozen ways to prepare spinach rice. This particular recipe is very simple, flavorful and quick to make. 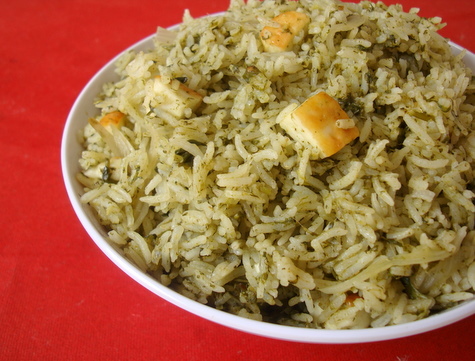 Mildly spiced with warm flavors, this green colored rice makes for a lovely one pot meal. I have also added lightly sauteed paneer. You can eat with raita or any curry of your choice. 1 Heat oil+ghee in a cooking vessel, add whole spices and bay leaf and saute for a few seconds. Add the sliced onions and sugar saute for 4 mts. Add the ginger garlic paste and crushed coriander-pudina-green chillis and saute further for 5 mts. Add the spinach puree and cook further for another 8-10 mts. Add yogurt and combine and allow to cook for a mt, stirring constantly. 2 Add the washed rice and saute for 2 mts. Add 3 1/2 cups water and salt and bring to a boil. Reduce heat, add paneer cubes (if using), cover with lid and cook till rice is done. 3 Serve hot with raita or any curry of your choice. Love spinach and that is the only greens we get most of the times here. I find ways to cook them in different ways. Just made this rice for the weekend a little different though. Quick and easy lunch box recipe , Thanks for sharing. Nice recipe, My dad likes spinach a lot, i will prepare this 4 my dad. Lovely Recipe. I have been following ur website for quite some time now. I have tried out many of ur dishes since i am just married and new to cooking ;-). My husband is in praise of the dishes and i should really thank u for that. That looks totally yummilicious!!!!! Loved those paneer chunks used to deck up the prep……. Sounds like a healthy variety…will try soon. I have a success story to share which came only from your palak chawal post. My kid, who is 3yrs old refuses to take any leafy veggies loved palak chawal like anything. I’m so surprised and more than happy when she got up from her afternoon nap and asked for rice (Palak chawal) again instead of regular fruit snack. I’m so happy to share this with you and thankful tooooooo. Hi Sailu, I want to try this recepie, but I have one doubt. What is meant by ‘BLANCH’. How to do it with spinach. please let me know. Boil a liter of water and place the spinach in the hot water and cook for 3 mts. Turn off heat and pour cold water over the spinach. Bring to room temp and make a paste. I used green peas instead of paneer. it tasted very good. I tried this spinach rice so many times. Its a wonderful recipe. Thanks a lot Sailu di..
can u plz tell me d difference between US measuring cup n indian? as i hv a cup wh measures 200 ml as full cup,but US cup measures 240 ml..m confuse wh to use? with curd how it taste ??? 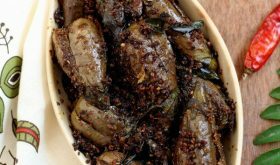 can we do without curd and sugar… my husband and me like very spicy …. This looks much easier than the one at which I tried (and failed) last night. I purchased a garam masala blend (already ground). How much should I use? very easy and tasty thank you. Nice recipe and it came out well too. Thanks.